Every Simrad steering innovation builds upon a legacy encompassing over sixty years of autopilot development, which continues today at Simrad Yachting’s autopilot research hub in Norway. This legacy is exemplified by the Continuum algorithm: the software that drives Simrad steering technology. Continuum brings all those years of research and on-water experience to your helm, for a smart pilot you can trust to take the wheel. The NAC-2 Autopilot Computer is recommended for boats up to 10 metres (35 feet) in length. It delivers standard power output of up to eight amps continuous and 16 amps peak, plus a clutch output; this is suitable to operate low-current drive pumps including the Simrad RPU80, mechanical drives such as the Simrad SD10, hydraulic linear drives such as the HLD350, and solenoid valves. Simrad Virtual Rudder Feedback (VRF) technology eliminates the need to install a separate rudder feedback unit aboard outboard and sterndrive (inboard/outboard) boats. This reduces overall autopilot system cost and complexity, and is ideal where a feedback unit is impractical due to mechanical constraints. Rudder feedback units are sensors that connect to your rudder via a mechanical linkage and continuously report actual rudder position to your autopilot computer – allowing the Simrad Continuum steering algorithm to make the best-informed steering decisions possible. These sensors are typically used on boats with inboard engines, on larger vessels, and in special applications where Virtual Rudder Feedback may not be suitable. 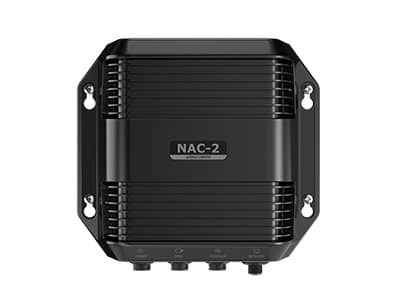 The NAC-2 supports SimNet or NMEA 2000® connected Simrad RF25 feedback units, and resistive rudder feedback sensors. Plug-and-play connectors facilitate easy installation, minimising the wiring necessary to install your autopilot system. Industry-standard NMEA 2000® networking offers simple connectivity to heading sensors, rudder feedback units, autopilot controllers, and multifunction displays located anywhere on board.